I love the comparison that’s often made between picture books and theatre. I’ve always felt shy about being on stage, but in illustrating picture books, I discovered I could be director, stage designer and a whole cast of actors, all from behind the scenes. For my latest book, this analogy even helped me discover a new way of working. I’d already collaborated on six picture books with Amber Stewart as author. Each one saw a cast of small woodland animals, sensitively tackling subjects significant to young children: a duckling starting school, a rabbit losing her security blanket, a little mole learning to try new foods. In each case, I approached the illustrations in the same way; using a dip pen, then fine brushes, to apply thin layers of acrylic paint onto smooth board. Too Small For My Big Bed portrays a mother tiger’s tender relationship with her growing cub, Piper, as he struggles to overcome his nightly fear of being alone. Suddenly, I had an even smaller cast to work with, (two! ), although of course, the actors were much bigger. 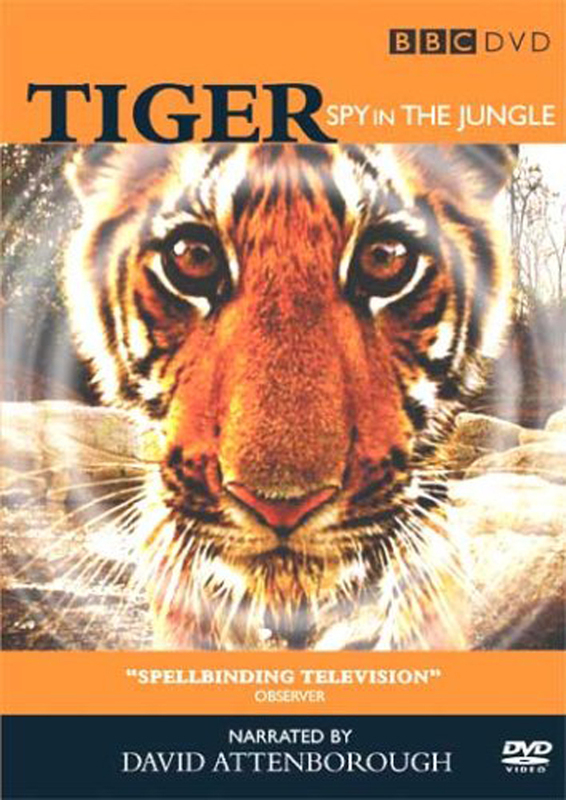 Tigers are not easy to observe in real life, even in captivity, so I’m greatly indebted to the marvellous John Downer film, Tiger – Spy in the Jungle. The narrator, David Attenborough, has described it as “the most intimate portrait of tigers ever seen”, which made it the perfect way for me to research mother and cub behaviour. The film also enabled me to see what the ‘jungle’ looks like. 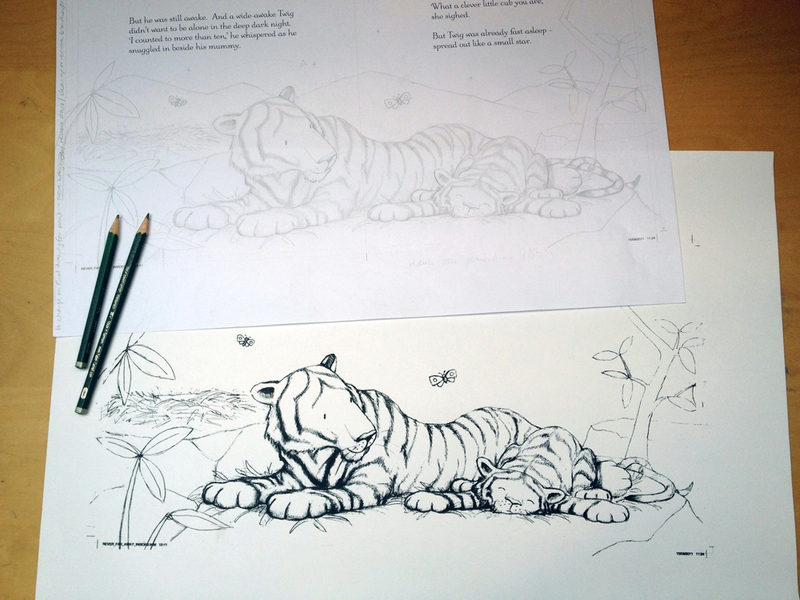 It was made in India’s Pench National Park, home to Rudyard Kipling’s Jungle Book. Having never travelled to India myself, I was surprised to see only limited greenery. In fact much of the Pench landscape looked just as Amber Stewart’s text describes – Golden Grasslands and Red Rock Ridges – colours more evocative of a tiger’s fiery coat. 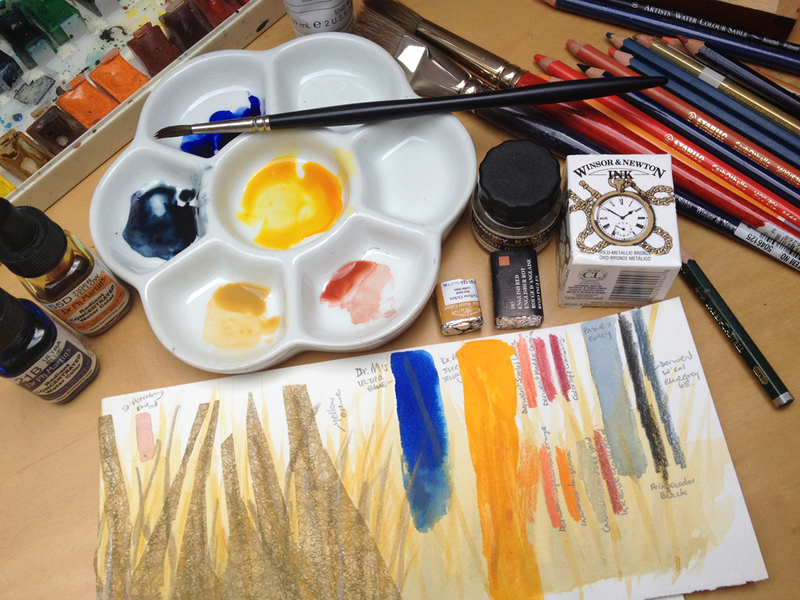 I realized these warm hues would contrast well with the deep ultramarine blue of a night sky, and so my new palette was chosen. In Too Small for my Big Bed, the close relationship between mother and cub takes centre stage. This is what gives Piper the feeling of security he ultimately needs to find independence. 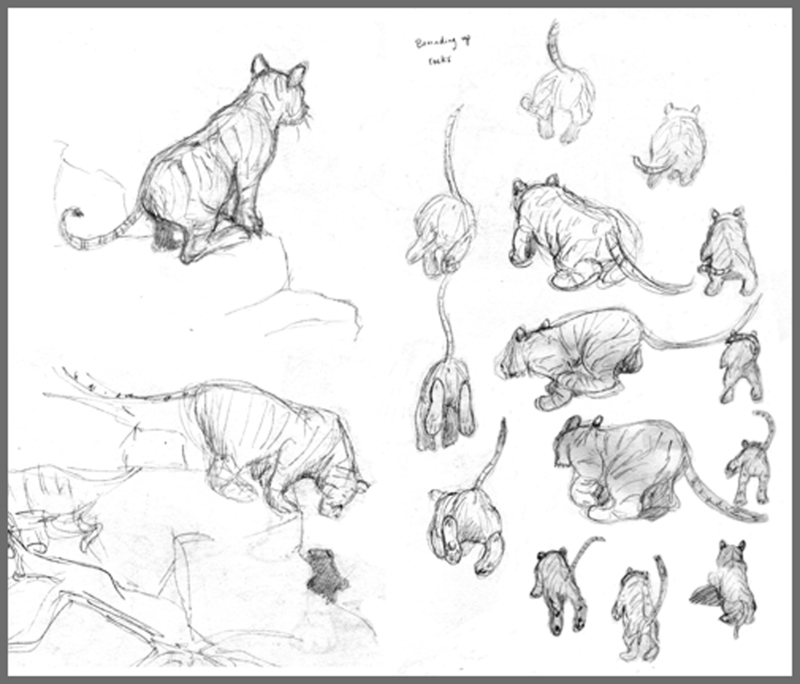 I tried to echo this intimacy in the gestures of the tigers, but I also wanted to strengthen their presence in the compositions. So, rather like applying stage make-up, I intensified the outlines of my pencil drawings by printing them with black ink onto watercolour paper. Previously I’d dismissed watercolour as a pale and unforgiving medium. Now I found deep, rich inks to use, and learned to be slightly less respectful of the high quality paper. I worked over the ink areas with coloured pencil, acrylic paint and even collage. With the spotlight on the tigers, I really began to treat the landscape more like a stage set. 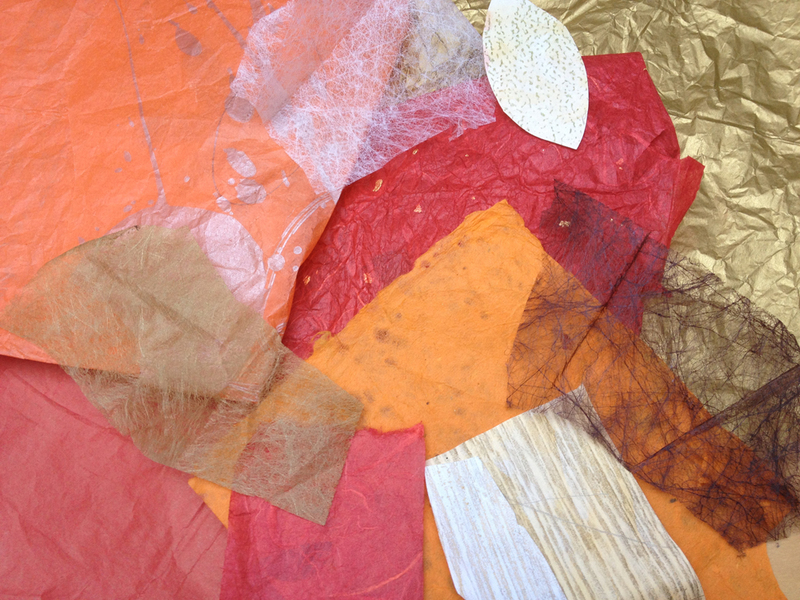 I enjoyed creating rubbings of various textures and seeking out other collage materials from which to build the ‘scenery’. Even though I’d long been aware of the theatrical analogy, somehow this time it felt to me like a real liberation. My favourite phrase in Amber Stewart’s text comes when we first see Piper fall asleep in his mum’s bed, ‘spread out like a small star’. I’ve already found that children love to identify with Piper as a character. They feel rightly proud of how they’ve grown and of all they’ve learned to do. I’ve thoroughly enjoyed the process of bringing Amber Stewart’s little tiger to life, and in doing so; I think I may have grown a bit myself! Born in Essex, Layn Marlow studied Art History at Reading University. She then worked in libraries, and lived in Belgium for some years with her young family, before returning to university to gain a first class degree in Illustration. 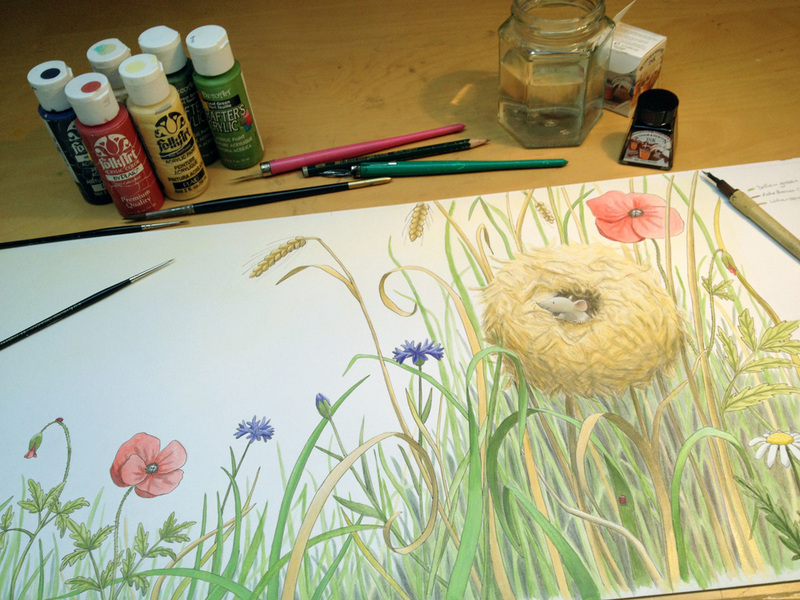 She has been writing and illustrating picture books ever since. Her books have won a number of awards, sold over a million copies worldwide and been translated into more than 20 languages. Layn is particularly inspired by the natural world, and now lives in Hampshire, where daily walks with her dog, Rufus, are essential. Visit Layn’s website and Facebook page. Too Small for my Big Bed is out now in hardback. The paperback edition is out in August.